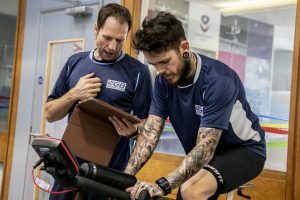 Great Britain Speedway Team hosted its first Performance Training Camp of 2019 last weekend, with 12 riders joining GB staff at Loughborough University for what was the first camp of several this year. The two-day camp saw the riders join Great Britain's Performance Specialist Chris Neville, Fitness Specialist Paul Suggitt and Physiotherapist Steve Williams, along with Nutrition experts Andy Kasper and Sam Burrows at the home of British sport, where they rubbed shoulders with some of the country’s elite athletes. The 12 riders, Tai Woffinden, Craig Cook, Steve Worrall, Richie Worrall, Kyle Howarth, Lewis Kerr, Danny King, Josh Bates, Dan Bewley, Drew Kemp, Jack Thomas and Nathan Greaves, arrived at the Elite Athlete Hotel on Saturday morning where they were presented with full training kit before undergoing a multitude of physical tests. After lunch, the riders were then put through their paces in the gym with several fitness tests and cardiovascular exercises, as well as some core strength and balance work. 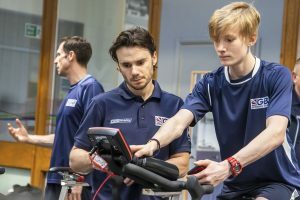 After a cool-down swim and team meeting, the group had an educational session with experts from Nutrition X, Great Britain's official nutrition partner, and on Sunday the riders underwent further physical tests and exercises. It was a hugely beneficial camp, and Chris Neville was delighted with the results. He said: “It was great to get the boys together at the start of the season and they all put everything into the camp. We wanted to do some tests with them at the beginning of the year and then it’s a lot easier for us to tailor their programme’s individually. Team manager Alun Rossiter was also pleased with the weekend, saying: “It’s brilliant that we can come here and do these camps, the boys all took it very seriously and worked hard and we can see where everyone is at with their fitness levels. “We’re amongst some of the best athletes in the country here, so it’s good that the boys can come and mix with elite athletes from all over and know that we are really moving everything on now.